Here is what I came across over IMDb on September 20, 2008 while going through much hyped upcoming Hindi movie based on novel of Chetan Bhagat. 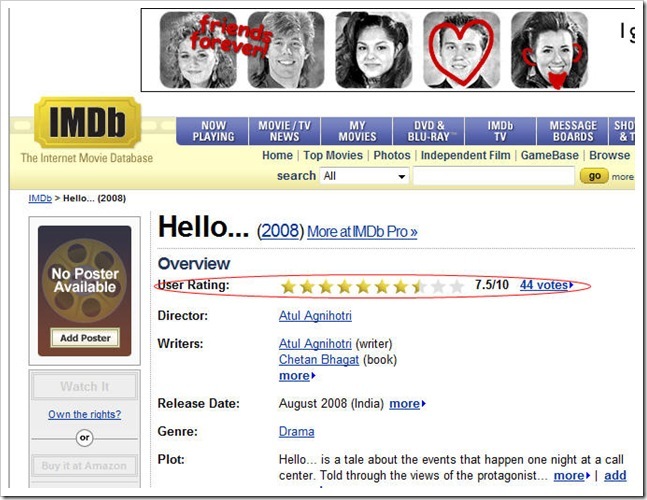 Name of movie is Hello and it was scheduled to release on October 10, 2008. The Release date was shown as August 2008 (India) on this page which is wrong information at first place (I think movie production can be held responsible for this). Secondly User Rating section was open which means users can rate movie even without watching it. That’s what was happening here where 44 users have already casted their votes before movie is even released making it already show 7.5 stars. In only probability to prove these votes valid is to show these users as those ones which were invited to initial screening of movie and it becomes obvious that they all are going to rate this movie on high scales (and others wouldn’t bother to visit this page). All in all, it appeared publicity propaganda to me which was used to hype the movie when it doesn’t possess impressive story or cast. This was another point turning me down not to go for watching this movie in multiplex. Also I am not one of those who liked writing works of Chetan Bhagat.